Take your yoga practice to a new level of core power and balance by practicing yoga on an unstable surface. The YogaFit Indo Balance Board training is like doing yoga on a paddleboard—without the water! Loaded with options and varying levels of instability with the Indo Flow cushions that come with the board, anyone can enjoy this practice and feel successful. 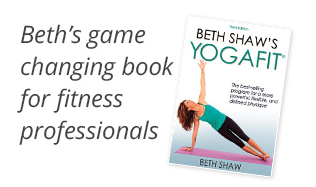 Appropriate for all levels of yogis, beginner to advanced. Note: The rental/use of the Balance Board is included in the price of the training, unless otherwise noted. You will have an opportunity to purchase one after the training.